Without certain DNA-binding proteins, chromosomes can escape the cell nucleus. M. Jagannathan et al., “A conserved function for pericentromeric satellite DNA,” eLife, 7:e34122, 2018. 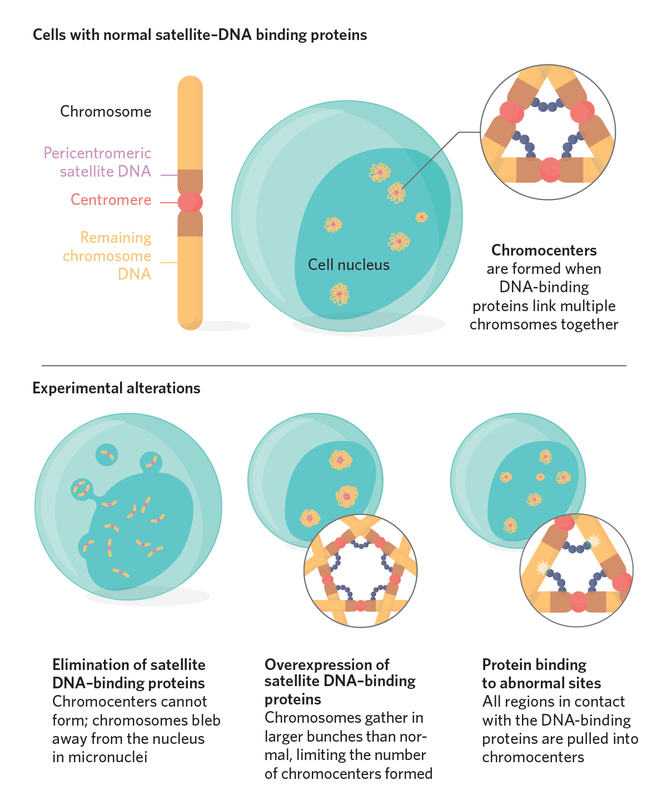 Between cell divisions, pericentromeric DNA—noncoding, repetitive satellite DNA abundant around centromeres—bunches together across several chromosomes to cluster them into structures called chromocenters. 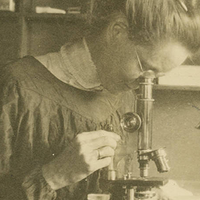 The function of pericentromeric DNA and of chromocenters had remained largely unknown until cell biologist Yukiko Yamashita and her team at the University of Michigan set out to see what would happen to fruit fly cells without them. 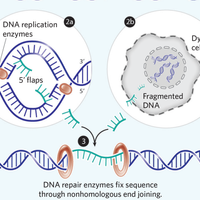 Simply mutating or excising pericentromeric DNA, which occurs as long sequences of tandem repeats, would have been impractical. So Yamashita’s group instead targeted a protein, D1, that’s known to interact with satellite DNA. When D1 was mutated, fruit fly germ cells did not survive for long. 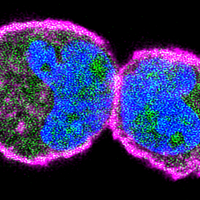 The researchers stained these mutant, dying germ cells with an antibody for Vasa, a cytoplasmic protein, and saw dark spots that turned out to be micronuclei, aberrant structures that can form when rogue chromosomes escape from their chromocenters and cause bits of the nuclear membrane to bud off around them. Yamashita’s team proposes that the protein D1 binds to pericentromeric DNA on multiple chromosomes, in effect locking them together in chromocenters. Without this protein or the requisite DNA binding sites, the chromosomes simply float away from each other, leaving behind incomplete nuclei. 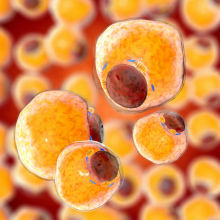 To see if these results held up in mammals, the team carried out similar experiments in mouse cells, and found that knocking down a D1 analog called HMGA1 caused micronuclei to form. Next, Yamashita and her colleagues expressed the D1 protein from fruit flies in mouse cells and saw that fewer chromocenters formed with higher levels of D1 in a dose-dependent way—indicating that in cells with elevated levels of the fruit fly protein, the chromosomes were forming larger bunches. Even though D1 and HMGA1 bind to different DNA sequences in their native species, the former had evidently interacted with mouse pericentromeric DNA. In another experiment in flies, the team attached D1 to DNA sites that don’t naturally interact with the protein and saw that those regions were pulled into the chromocenters. Thus, pericentromeric DNA’s function may be to ensure that all the chromosomes that make up a genome stay together. Aaron Straight, who studies chromosome biology at Stanford University and was not involved in the study, says the disruption of the nuclear membrane and budding of micronuclei is an unexpected result of knocking down the proteins that bind pericentromeric DNA. “That, I don’t think, could have been predicted,” he says. He adds that whether the absence of chromocenters leads to micronuclei formations remains to be seen.